We can bring our Ultraviolet presentation to your next meeting or event. We put on a fantastic presentation that will inform and entertain people of all ages. We have hands-on activities for the kids as well as spectacular fluorescent mineral specimens. Our presentation can be tailored to your event to fit into any time frame from one half hour to one and a half hours. Contact us to see if your event date is available. A small fee will be charged for the presentation which includes our transportation costs to your location, lodging if required, meal expenses, and the cost of handouts and other materials used during the presentation. 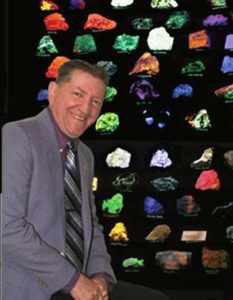 I saw one of UV Bob’s programs and was amazed by all the different rocks I saw on display. When he first showed us all the rocks they looked normal other than some odd shapes. Most of them were brown, grey, and earthy colored, but when he turned on the long and short waved UV lights the rocks were orange, red, green, yellow, purple, and basically a rainbow of colors. One of my favorites was the glowing sphere he showed us, I even bought one of my own online after the show. I was surprised to see that the rocks were from all over the U.S. mostly from different states. The show was very entertaining for young children and adults as well. His show gave children the opportunity to interact with the program and provided educational information for adults also. The show was even better because you could tell UV Bob was passionate about the topic and he wasn’t just spitting out facts. UV Bob also had many cool pieces of artwork that included the same type of phosphorescent materials which made the show even more interesting. If I had the chance I would definitely like to see UV Bob’s presentation again.